Banacek AMX 400 aka Phoenix ESV Experimental Safety Vehicle -George Peppard’s Custom Ride! | Star Car Central - Famous Movie & TV car news! Banacek AMX 400 aka Phoenix ESV Experimental Safety Vehicle -George Peppard’s Custom Ride! Banacek (one of the rotating NBC Mystery Movie series)was a short-lived, light-hearted detective TV series starring George Peppard (of A-Team fame) on NBC from 1972 to 1974. It alternated in its timeslot with several other shows but was the only one to last beyond its first season. It was later rebroadcast on A&E Network. The show had a mixture of humor combined with rather intricate plots. The show was well received by critics and was picked up for a third season. However, before the third season could start production, Peppard quit the show in order to prevent his ex-wife Elizabeth Ashley from receiving a larger percentage of his earnings as part of their divorce settlement! I am sure Banachek would have an old polish proverb for that situation! The regularly featured cars in the series were a 1941 Packard 180 with a Victoria body designed by Howard “Dutch” Darrin (license plate number 178344) and a 1973 Cadillac Fleetwood limousine. “The Phoenix, a crash-proof ESV (Experimental Safety Vehicle) worth $5million manufactured by RW company. Totally driver-proof safety vehicle. One of the sensational innovations found in this car is a compensator. 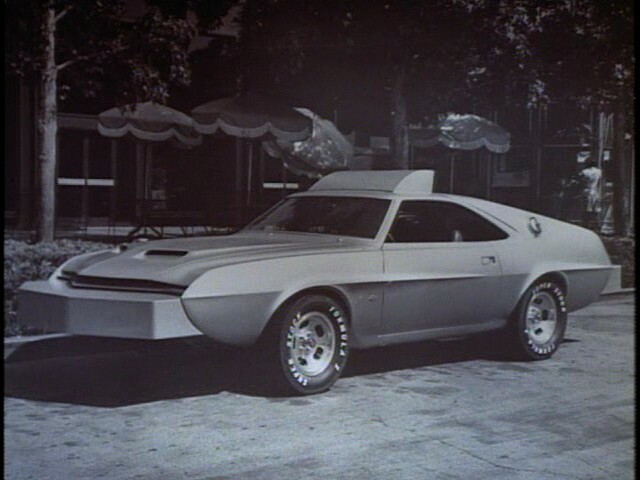 It is mounted to a small on-board computer system and it automatically corrects skidding and fishtailing caused by oversteer.” In ONE episode this special prototype car of the future is stolen off of a moving train, and Banacek is called in to solve the mystery! Below is how the car appeared on the show, with large cardboard bumpers added and a new temporary paint job! How the car looked when it was the ESV safety car! Before it was the Phoenix, it had been around awhile. In the late 1960s, Barris teamed up with the American Motors Corporation to produce a bolt-on customizing kit for the AMX that was marketed through AMC dealers. Through this connection, George got his hands on a factory-fresh 1969 AMX and gave it the full Barris treatment. When Barris got the AMX 400 back from the show the paint was removed, and it was restored to its former look. The car went on the road with the International Show Car Association (ISCA) and appeared at every major show around the country. That’s when it got its reputation as the most photographed AMX in the world. After the car-show tour, the AMX disappeared for a while before turning up in a museum in Nags Head, North Carolina. It was then sold into Tom Monaghan’s Domino’s Pizza collection. When Monaghan only had a few stores, he had red, white, and blue AMC Javelins for delivery cars. When his pizza franchises took off, he built a 244-car collection. Eventually, he decided to sell everything. Mike and Lin Geary acquired the car in 2003 in relatively sound condition, with a mere 3300 miles on the odometer, and set about refurbishing it. The car was repainted by Tabz Toys in Lan­caster, New York, and Ron Lasker re-created the original pinstriping. The biggest modification was the chopped top, which came down 4-1/2 inches. In the process, the windshield posts were raked back two inches, and the rear window was inset between the ­”flying buttress” rear ­pillars. The nose of the custom car was extended 15 inches and given a wild new look with a radical peaked louver grille. Rectangular headlights were hidden behind three bladelike grille bars, while the hood was revamped with twin scoops and a peaked tip that matched the grille bars’ shape. All four wheel openings were radiused, and custom front bodyside flares were added to match the enhanced rear body character lines. The rear of the custom car was extended eight inches and reconfigured with a row of 15 louvers that started at the top of the rear window and continued all the way down the trunklid and rear fascia. A novel taillight system featured a full-width light that glowed green during acceleration, amber during deceleration, and red during braking. Body details included a wild set of three-inch-diameter side pipes and a pair of competition-style fuel-filler caps. Both filler caps are just for looks; the actual fuel filler door is at the rear of the car. A two-tone paint scheme in cream-toned Murano Pearl and Rustic Orange cleverly utilized the car’s body lines as color breaks. The car was then reunited with its creator in Detroit at the ’05 Autorama. Interest in the car spread quickly, and Geary received an offer to display the AMX 400 at the Walter P. Chrysler Museum’s Hot Rods and Cool Mods exhibit, where it stayed until late 2006. Recently watched this episode and for all the work done it’s never driven on the show. « Edelbrock and Starcarcentral.com join forces for Revved up for Kids event May 1st!